Located near Interstate 90, provides a convenient location for traveling to Mt. Rushmore, Crazy Horse Monument, Devils Tower and many other National Parks. Centrally located to all major attractions and National Parks, this South Dakota Best Western provides affordable and comfortable accommodations, making it the perfect place to stay. Visitors of the Best Western Sturgis Inn can experience the breathtaking magnificence of Mount Rushmore, Bear Butte State Park and the Black Hills. There will never be a dull moment during your stay, with so many local attractions, there's always something to do while visiting this Sturgis, SD hotel. Indulge in some retail therapy at Rushmore Mall or partake in many recreational activities at Sturgis Community Center, Wooded Field Park and Lions Park. The Best Western Sturgis Inn, is perfect for those participating in the Sturgis Motorcycle Rally, and don't forget to visit the nearby Motorcycle Hall of Fame. Many visitors also choose to stay at this South Dakota Best Western for the other events, such as the Mustang Rally. Those traveling on business have just a short commute to the Ft. Meade Veterans Hospital and Ellsworth Air Force Base. The clean, charming rooms at the Best Western Sturgis Inn offer free high-speed Internet access, cable satellite television, a coffee maker, a desk and much more. While staying at this Sturgis hotel, guests can also enjoy a large indoor pool, hot tub, game room and free parking. Get a great start to your day with a complimentary full breakfast, served daily. 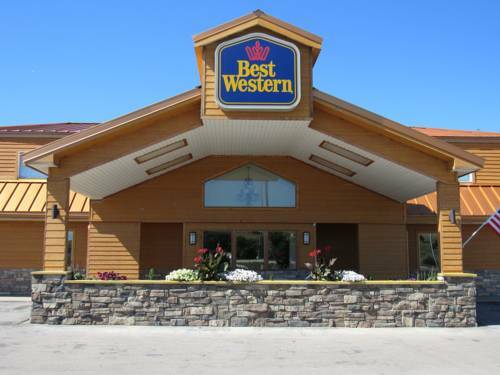 For a great stay at a hotel in Sturgis, South Dakota with phenomenal customer service, reserve a stay online at the Best Western Sturgis Inn today. Welcome to the Best Western Sturgis Inn! When traveling with your four-legged family members, be sure to reserve a pet-friendly room as availability is limited. From: Interstate 90. Take Exit 32 follow to the Best Western Sturgis Inn. This was horse thief Harry "Sundance Kid" Longabaugh's home town, and the jail where he served time. Outside the former jail, the town has erected a statue of the kid lounging in his cell.